Mobile Eyes: Catching Up . . . Again. Catching Up . . . Again. Imagine if there were a type of search engine that indexed your whole person. Based on genetic markers, psychological states, and social situation, this engine could not only give you an accurate inventory of your own traits, talents, and weaknesses, but could also predict, with uncanny accuracy, the reasonable probability for success of any action, train of thought, or plan, you might develop; as well as predicting your near and long term health. It would serve as a combination wise physician and agony aunt or counselor. Such a utility would be invaluable, and all you'd have to do, in order to have it, is agree to give up any pretense to privacy: your personal index, with its probabilities and predictions, would be mirrored on several servers - some of them commercial - where the dynamically changing real-time data would be used for tailoring advertising campaigns directed to you; - and some of them owned by state agencies, for the simple reason that state agencies love this sort of data - or would love it, if they could get it. This is the search engine Google would like to have - one more step toward becoming the mind of God (their oft-stated goal). We're not there yet, but I kind of felt like we were when, a few days ago, I installed Yahoo's beta version of desktop search. I already had a pretty good mental inventory of my own data on my home machine, so, given its current limitations, Yahoo's desktop search wasn't all that useful to me. There's a long list of file types the utility can find - but I still felt as though there was a great deal it was missing - just what I'm not sure. I imagine that in the aggregate, a machine you've been using for awhile says more about you than even you know. Or that's the thought, anyway - and I'm not sure I like that thought. Inference is best left, I think, to highly trained Viennese psychiatrists. But that won't stop corporations and governments from thinking they have it right. No sense in helping them. On a more positive note, Yahoo's new Creative Commons search is fantastic. Fantastic because it is truly innovative and useful, allowing you to mix, match, and mash up other people's work, even for your own commercial purposes, without fear of stepping over the boundary from fair use to actionable offense. Providing such a service is, in my view, the true role of search engines - and far preferable to trying to be the mind of God. For the past few days I haven't done any blogging - something you'll have noticed if you're a regular reader. interestingly, I've been getting almost as many hits not blogging as I do when posting regularly. Right now there are maybe ten people who come back here regularly, plus ten or so more who subscribe via RSS feed. Most days this weblog gets about one hundred unique visitors - though, depending on the topic and the time of week, that can go up to as high as one thousand. All told, a small and obviously select readership. And not bad, considering that it's so new, and still in the process of taking on a definite identity: tech blog? photography blog? personal diary? blog of whimsy? All of these and none, of course. It's surprising to me how much time it takes to blog every day. In order to find something worth writing about, or pointing out, I first check the links over to the right; then, if need be, and if there's time, I go through a long list of RSS feeds that I have set up on a My Yahoo page devoted to science and tech. When I finally get an entry written, with links and just the right images, I often have several hours into it. And that's assuming I don't get distracted along the way. I suppose I should fire up Photoshop and rig some sort of Gone Fishin' sign, for those times when I just can't get to it, or don't want to. Here are a couple of things that I would have blogged about, had I been blogging over the past few days. "Our living Earth nurtures an abundance of life. And we believe that human beings are the peak of all those abundant life forms. Human beings are the only ones that have created glittering civilizations one after another, or have sent rockets into outer space. But it is also these outstanding human beings who have damaged nature and our world to a critical degree. Now, we have also started to notice that we have to believe in all seriousness that our living planet Earth is made up of a delicate balance of life forms, and that Earth itself is one living organism. "That's true. The biggest living organism on Earth is Earth itself. We must protect this important living thing, this irreplaceable Earth, and by making this life even more brilliant, human beings can make themselves truly great. "Through this exhibition of EXPO 2005 AICHI JAPAN, we in the Mitsui Group want to help people live healthily and prosperously on this greatest of all living things: our planet. A world sparkling with life - that is the theme that we in the Mitsui Group wish to pass on to the children who will support the next generation." This copy is from the website devoted to the Mitsui-Toshiba pavilion at the above-named expo. So refreshing to see such optimism. How unlike the dreary pessimism and (Christian) nihilism that is so often manifest in the west nowadays. Current Christian nihilism in the West notwithstanding, one of the things I most like about Europe (which shows a promising abandonment of such ideology) is its recent tradition of form follows function. 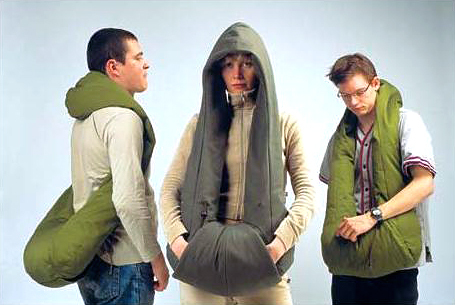 Here we see it manifest in taking the hood-is-home concept of the hoody to its logical extreme. The illustration above is from the international (but decidedly European) design firm Gopingpong. Both Gopingpong and the reference to the Mitsui-Toshiba pavilion are from what has become my favorite weblog of all, Near Near Future (AKA We Make Money Not Art) - like BoingBoing, but without the smugness and self-conscious hipness.